To fill the void, I started hanging out - quite a lot - at Miss Lily’s; a Jamaican joint on West Houston. A great little luncheonette, where you can enjoy a taste of Caribbean cuisine. I can confess without shame that I have tried almost every single item on the menu, and they all tastes great. I have favorites, but the jerk chicken stands alone at the top of my list. It’s a great dish, full of depth and character. A great flavor combination that will send your taste buds into a spin of fireworks. 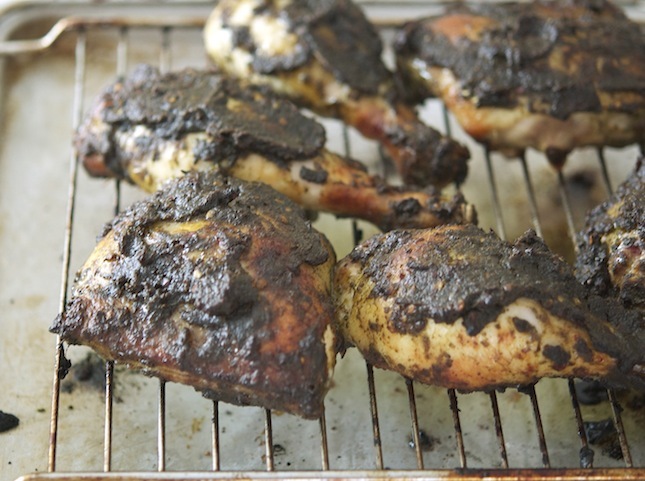 The allspice - or pimento as it’s called in Jamaica - is the secret to jerk chicken. It adds about five flavors in one, it’s a powerful little thing. Then there’s the scotch bonnet pepper, it will set your mouth on fire, but in a nice way (if there’s a “nice” way to set one’s mouth on fire). 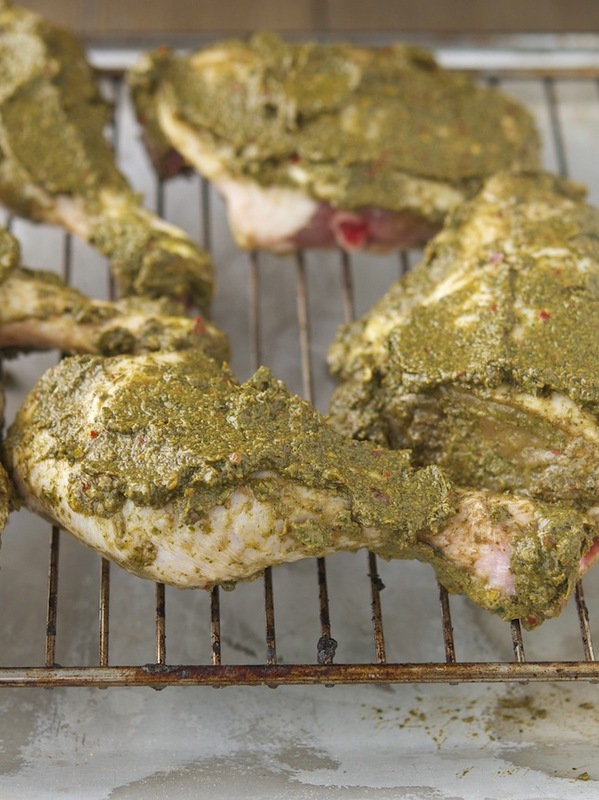 In other words, a jerk chicken is anything but blunt, boring or tasteless. There’s so much to it, no room for disappointment. Fact. Now let’s talk about this recipe. I did my own fair share of research. That included interviewing an endless number of Jamaican cab drivers on the streets of NYC. They were all very eager and enthusiastic to talk about the cuisine of their beloved country. On two points they all seemed to agree: (1) that jerk chicken is Jamaica's signature dish and (2) that their own mum's recipe is the one and only true recipe for jerk chicken the rest is "Fake man, just fake!" I took a lot of notes and learned. So I tried a number of recipes: some were YUCK, some were OK, some were very good. I’ve tweaked and tweaked and tweaked and I believe this one to be the best one. Or better yet, the closest to the jerk chicken you can order at Miss Lily’s. Good enough for me. 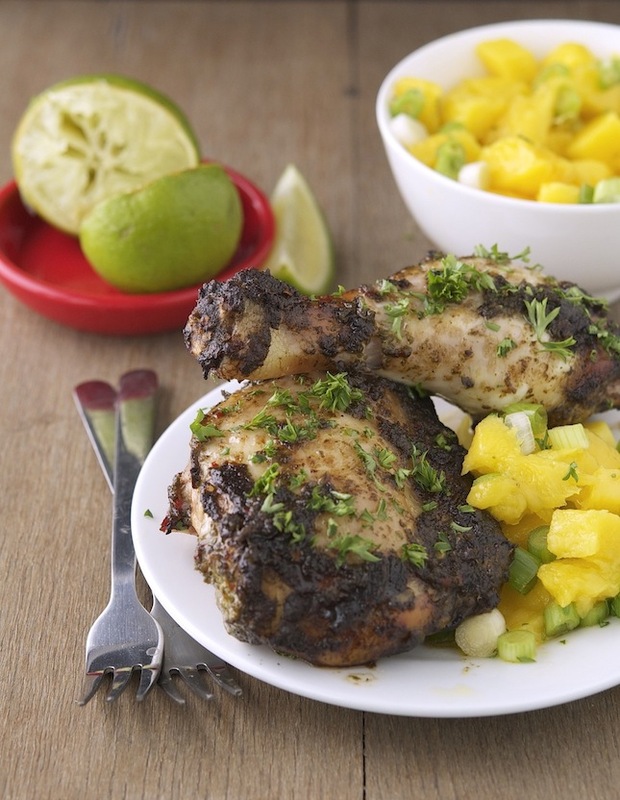 Jamaican Jerk Chicken with Mango Salsa Print this recipe! There’s one thing you need to be careful with and that is handling the scotch bonnet peppers. I’m not joking. You must wear gloves and makes sure not to rub your eyes or touch your lips. It’s not going to be funny, I learned the hard way. Also, I’ve found out that removing the seeds and most of the ribs from the peppers reduces dramatically the heat, which is my personal preference. But if you enjoy a firestorm, go with the whole thing, stay with it, it’s your pain after all. In a blender combine allspice, black pepper, honey, parsley, cilantro, scotch bonnet peppers, garlic, ginger, scallions and olive oil. Blend until pureed and smooth. In a shallow sealable container (or in a large Ziplock bag), pour the marinade over the chicken and massage it in (wear the rubber gloves!). Marinate in the fridge at least 1 to 2 hours (overnight for fullest flavor). Heat a grill (or a grill pan) over medium heat; place the chicken, skin-side down and cook for 40 to 50 minutes, turning often, or until the chicken is golden and cooked through. You can also cook the chicken in the oven at 400°F (200°C) for 25 to 30 minutes, turning occasionally. Turn on the broiler for the last 5 minutes to get all lovely and charred. In the meantime make the mango salsa by combining all ingredients in a medium bowl and mixing well. 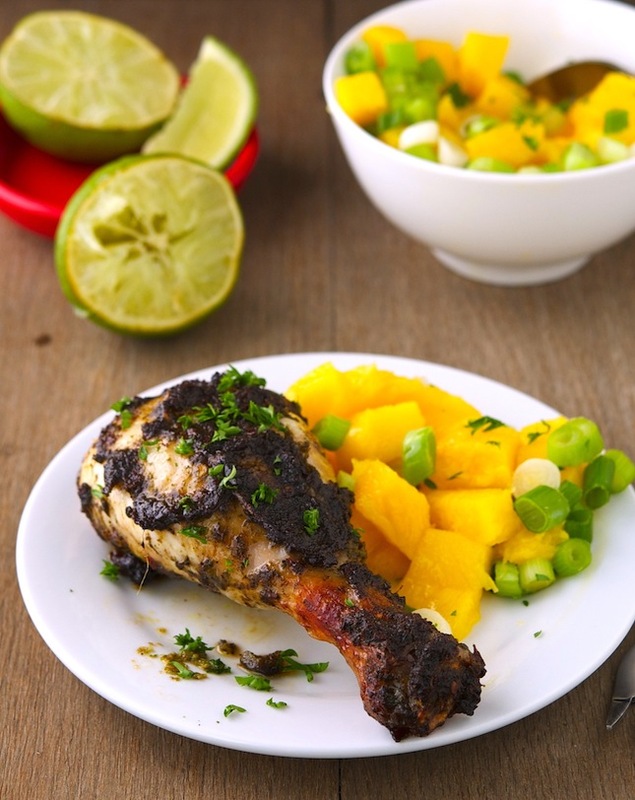 When the chicken is cooked drizzle with fresh lime juice and serve with mango salsa. One serving yields 481 calories, 27 grams of fat, 20 grams of carbs and 39 grams of protein. FINALLY something I'm drooling all over and CAN have! Thank you, thank you, thank you, my friend! This jerk chicken is so inviting and good looking. I was hunting for a good rub, there I have one. THanks for sharing the recipe. Oh gawwwwsh! Your chicken is making me so so hungry! I haven't had chicken for so long and your recipe is just what I need to try! Yeah, Jamaican jerk chicken - i never eat and heard about Jamaican version of chickens.